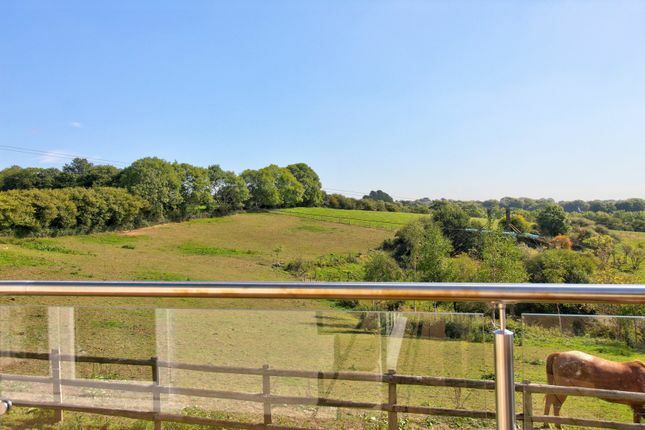 A lovely big family home in a beautiful rural setting and with simply stunning views. This is also a property which offers a lot of potential with various possible business and development opportunities. This chalet style home in set in approx 2.6 acres of gardens and fields. The property is approached through stable gates and down a gravel drive. Immediately to the front of the property is a brick build office/garage unit. This could be perfect for conversion into a livable annex or to use as an office gym or holiday let. Next to this is the steel framework for a massive barn/workshop. A little further down and there's a large stable block which again would lend itself to conversion into holiday lets (subject to the usual planning permissions). The main bulk of the land consist of a fenced field and a further fenced paddock. There is also a family swimming pool with a large pool patio, perfect for parties and barbecues. The property itself is bright, spacious and has extremely adaptable accommodation. From the main door you enter the hallway which has doors to all the ground floor rooms. First you have a really nice sized family lounge with superb views out over the fields. The kitchen/breakfast room is very bright and modern with three sets of doors leading out to the sun deck. 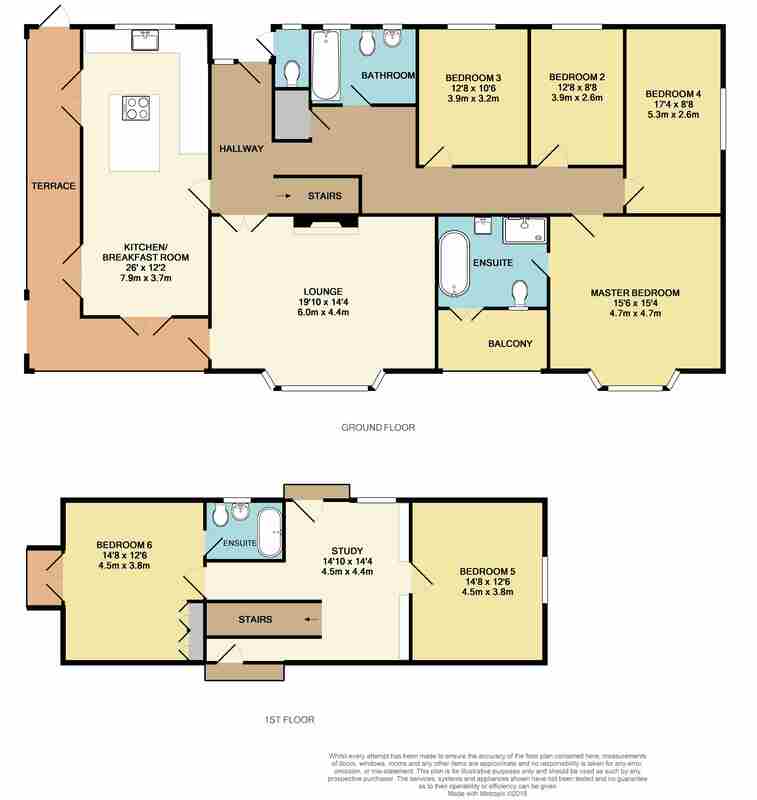 Downstairs there are four bedrooms, one with an en-suite and an additional family bathroom. One or more of the bedrooms could be used as a lounge, games room or study. Upstairs there's a large landing which makes a perfect office (see photos); ideal for anyone working from home. Off each end of the office is another double bedroom, one having a balcony and an en-suite. This really is one of those properties that you have to view to fully appreciate what's on offer. Sit on the sun deck and check out the views for real and you'll be sold on this one! Call us today to arrange an appointment. The Porch and front door take you through to the hallway which has doors to all the downstairs rooms. Lounge: 19'10 x 14'4 With fantastic views over the fields and beyond. A bright double aspect room with a large exposed brick fireplace, with a fitted wood burner and a door out to the terrace. Double glazing. Radiator. Kitchen/Breakfast Room: 26' x 12'2 A very bright room, again with stunning views and with three sets of double doors all leading out to the terrace. The kitchen is well fitted with an oven, hob, microwave, dishwasher and a wine fridge. An excellent range of modern kitchen units with granite worktops including an island with an inset hob. Space for a large fridge freezer. The breakfast/dining area has plenty of room for a 6/8 seater table. Double glazing. Radiator. Terrace: The terrace is "L" shaped and overlooks the swimming pool area on one side and fields on the other. Decked and with a toughened glass surround this is a lovely area to sit and enjoy the views which are pretty unbeatable whichever direction you're looking in! En-Suite: Door out to a small balcony area overlooking the gardens and fields. Luxury fitted, with a freestanding bath, a supersize shower cubicle, a washbasin/vanity unit and a wc. Chrome heated towel rail. Quality ceramic wall and floor tiles. Double glazing. Radiator. Bedroom 2: 12'8 x 8'8 Double glazing. Radiator. Bedroom 3: 12'8 x 10'6 Double glazing. Radiator. Bedroom 4: 17'4 x 8'8 Double glazing. Radiator. Bathroom: Leading off the hallway. Luxury bathroom suite with a bath, wash basin, wc and shower cubicle. Chrome heated towel rail. Quality ceramic wall and floor tiles. Study/Office Area: 14'10 x 14'3 As you'll see from the photos there's plenty of space for a really decent office arrangement. Velux windows. Eaves storage. Fitted shelving. Radiator. Bedroom 5: 14'8 x 12'6 Double glazing. Bedroom 6: 15'6 x 14'8 Double glazed with doors out to a small balcony area enjoying panoramic views. Outside: The whole plot is approx 2.6 acres. A stable gate gives access to the driveway which winds down to the back of the house (the front being the aspect that faces out over the fields and paddocks). There are two separate paddocks. One is currently rented out on a month to month basis for two horses. The other paddock has also been rented out in the past. Stable Block: There is also a substantial stable block which in not currently used. The current owner had considered converting this into a number of holiday let units. No planning has been granted and any prospective purchaser should make their own enquiries, but this block could represent a possible business opportunity. Annex Building/ Office room and parking. Brick built under a tiled roof. Insulated and with full light and power. This self contained room has been used as an office and a gym. This main office room is approx 18'6 x 18'6. There is also scope to knock through into the parking area in the second half of the building. This could make a fantastic annex for relatives or maybe someone who runs a business from home. The Pool: Surrounded by a really good sized paved patio with plenty of room for sun loungers, furniture and a barbecue. Perfect for a pool party and wherever you sit you've still got those amazing countryside views. Immediately upon entering the stable gates to Bennic Farm you'll see a small drive leading up to a corrugated barn. This area/plot has planning permission for a two bedroom bungalow with a small garden and currently has interest from a developer. At the time that Bennic Farm was first advertised the owner was open to discussion on this plot as nothing has yet been finalised. It is not however included in the sale at 1.2 million. If this is of interest to any prospective buyers they should speak to YOPA. Our opinion is that this small bungalow would not detract from the saleability of Bennic Farm and would have no impact on either the views or privacy that the Farm enjoys. Property descriptions and related information displayed on this page, with the exclusion of Running Costs data, are marketing materials provided by YOPA, and do not constitute property particulars. Please contact YOPA for full details and further information. The Running Costs data displayed on this page are provided by PrimeLocation to give an indication of potential running costs based on various data sources. PrimeLocation does not warrant or accept any responsibility for the accuracy or completeness of the property descriptions, related information or Running Costs data provided here.